I spotted these happy silver and gold cupid arrow sticks and I thought how fun they would look in a mason jar on our coffee table. And how fun they would be to make as a valentine crafts. In my mind, I am substituting my whimsical colorful decorations with ‘no-thing’ or ‘white things’. 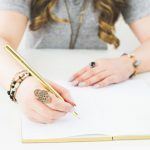 Fewer objects, more tranquil white or cottage comfort cream colors would offer a better backdrop for my eclectic design and (too) colorful creativity. So, when I started out figuring out what to do for Valentines this year, I was determined ‘no pink hearts’ for my living room. In comes this idea: how about a mason jar | flower vase filled with Valentines treats that look like a cupid arrow? In a strong commitment to opt for rustic colors and a bit of originality, I walked over to our local park to collect some branches. Naturals, with gold and silver… mmm… Very good. Tammy Henderson, our monthly home decorating contributor would be proud of me, or so I thought. But.. then what happened??!! Well, sorry folks. I can’t help myself! On the ‘tree’ that is me, only colorful apples grow! Initially the display was on my living room table. But I found a better destination: in front of my hand-signed Primo Angeli ltd. edition print for the Olympics. It depicts the quintessential ‘Athlete’. 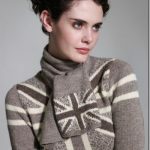 How perfect is that?! 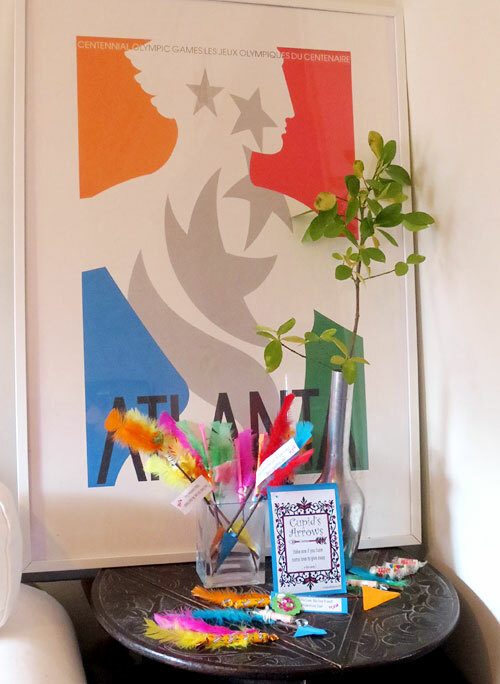 And so, after I washed the branches and found a silver tin to put the branches in, I membered that I had a bag full of colorful feathers, left over from my Mardi grass mask. The rest is history. 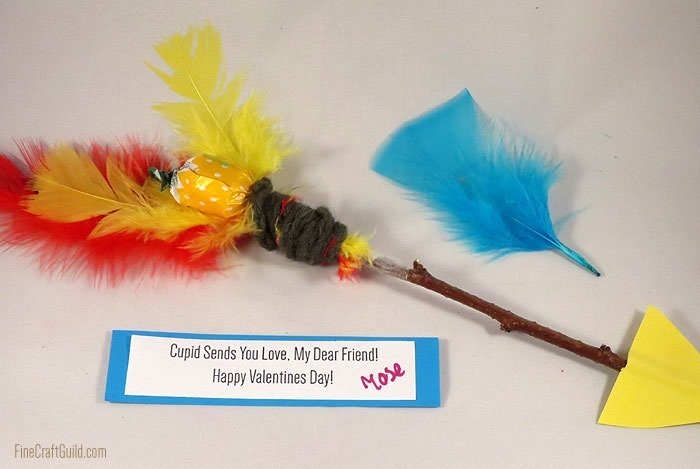 Walk over to the kitchen for some long-shaped candy, and voila, I created this darling, but very colorful set of feathered Cupid arrow Valentine treats. 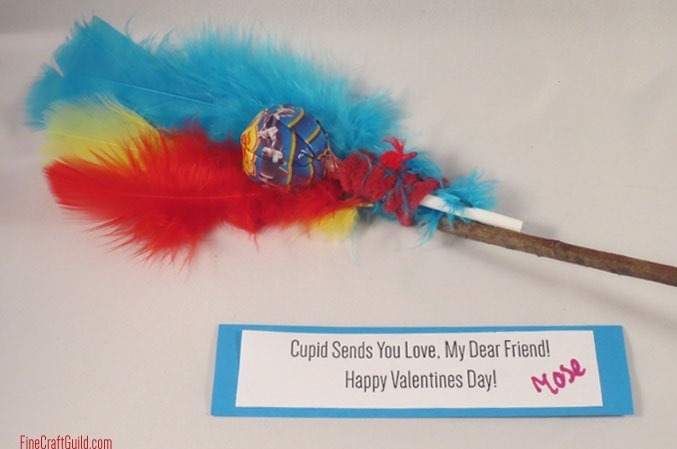 Make 24 of these (together with the kiddos) and you’ll have a fun school Valentine treats to hand out. Cupid is sending you some love, my friend! 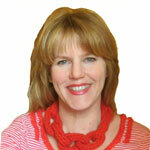 I created some Valentine Cupid free printables for you as well, which could double as name tags. Kids will love these Valentine treats. I opted for a Valentines’ quote that’s not too cheesy and befits ‘friendship’ rather than ‘true love’. More appropriate for kids. A bag of craft feathers . A pack of wrapped candy with the right shape and weight. Candy that works well includes: chupa chups , narrow, rectangular caramel candies, or candy powder sticks. A bunch of twigs, that are cut about the same size. 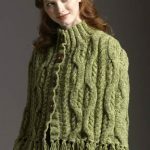 Fasteners: string, yarn, tie wraps, Scotts tape… All of these will work, but yarn looks best. 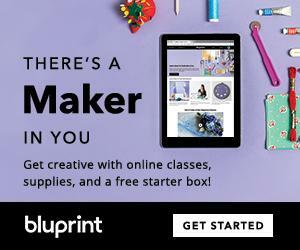 Matching Heavy-weight Construction Paper in happy colors or craft foam cut-out triangles. 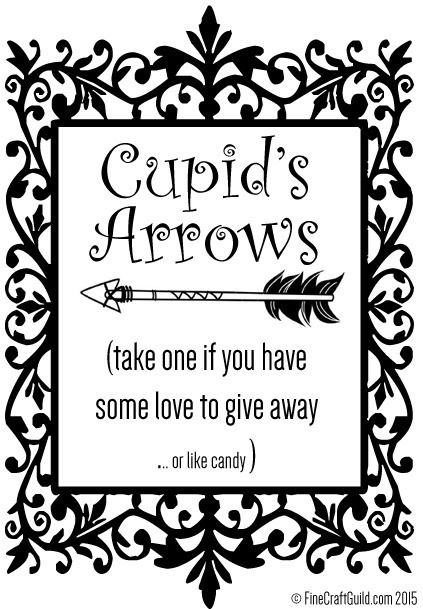 My Free Valentine Printables for Cupid’s Arrow Name Cards and Display Cards. 1. 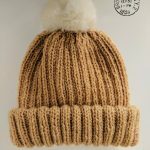 Cut and wash your twigs and dry them on a heater or with a blow dryer. 2. 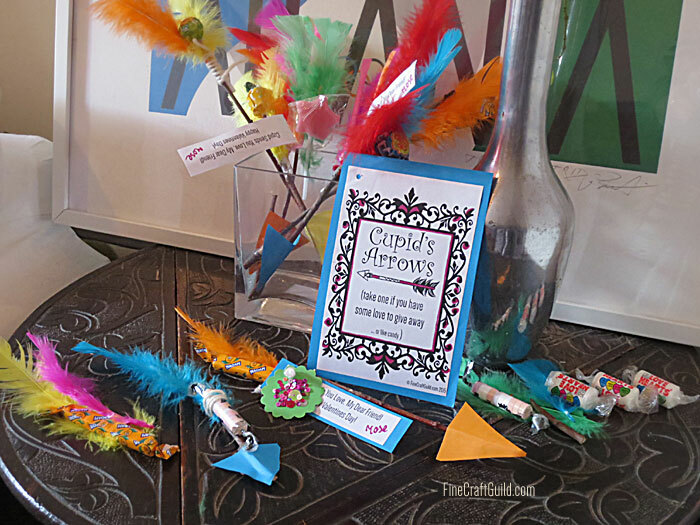 Pair up your candy in color and size with one or more feathers. 3. 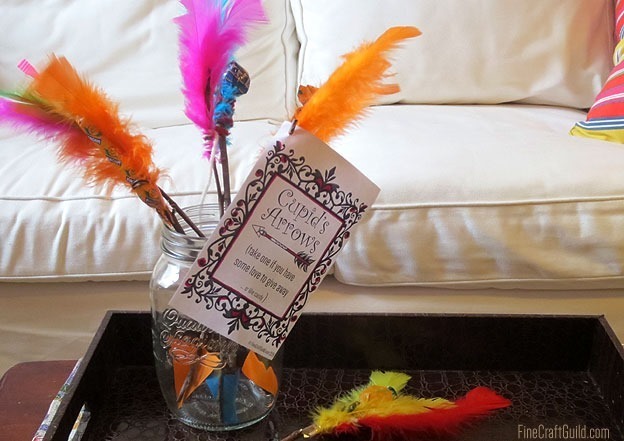 Attach the candy and feathers together on the tops of the sticks. Place them in the container. If the container topples over, make the sticks shorter, so that you’ll get a stable display. 4. 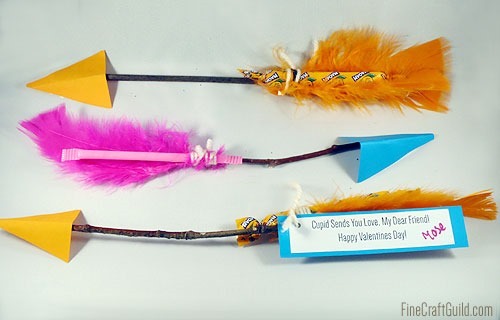 With a hot glue gun, white glue or even Scott’s tape, stick on the cupid arrow heads, and you’re done! 5. 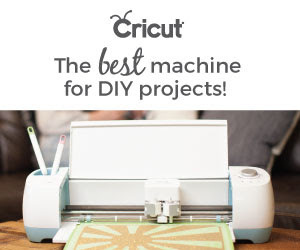 Cut out my free printables (I use a paper guillotine and I highly recommend it as it cuts large straight lines really fast and even.) and glue them onto colored card stock. 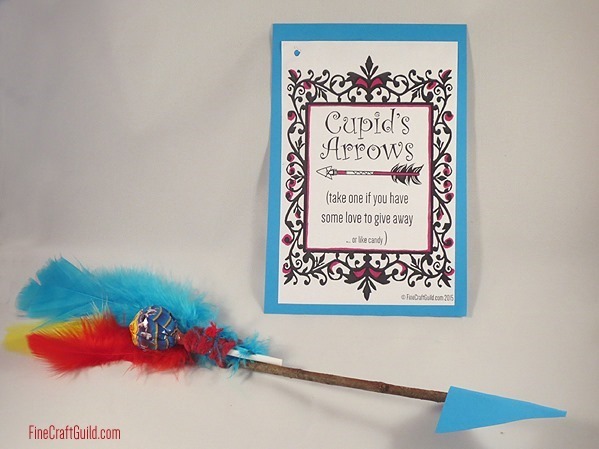 Attach a name cards onto each cupid arrow. Want other ideas for Valentines? 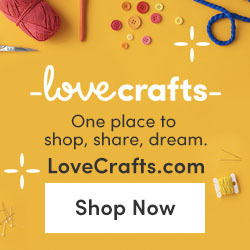 Valentine Gifts & Crafts – section. PS. 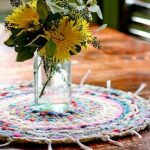 Next month, Tammy Henderson will be back with her monthly guest post on simple DIY decorations using either inexpensive or recycled materials. I can’t wait to see what she’ll bring us. 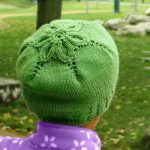 See you all back tomorrow with a free pattern! I don’t have kids but used to work in a middle school, so I wonder if kids might use them to hit each other? I like that you don’t have points on them other than paper. Anyway it’s a clever idea, and I love colorful decorations amid a quiet room. Very mardi gras coloring. i have tried 6 times to get to the newsletter sign up page… Nothing happens. 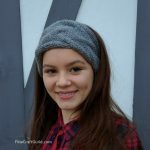 Would like the bow tote pattern? Oh Geeh, Deedee, i better get you your pattern…. I’ll email it to you now.